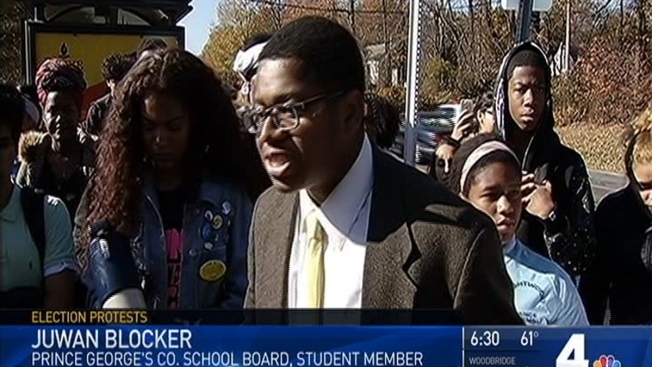 Dozens of high school students in Prince George's County walked out of their schools Friday to protest President-elect Donald Trump -- despite warnings from school leaders. One student was arrested and another escorted out during a demonstration at Dr. Henry A. Wise Jr. High School in Upper Marlboro, Maryland. The student arrested is accused of threatening a police officer, according to a spokesperson for Prince George's County Public Schools. Elsewhere, demonstrations were largely peaceful and reflective. Some students said they didn't have the opportunity to vote, but want their voices to be heard. "We were not old enough to vote so this is how we are going to represent," said a young woman participating in Parkdale High School's protest. A large group of Parkdale students walked out at noon and chanted "Love is love." "When we have people who are saying that we need to stop protesting because we can't change the election, they're missing the point. They're missing our message," said Juwan Blocker, a student member of the Prince George's County School Board. At Northwestern High School in Hyattsville, students recited politically charged chants as passersby beeped to show their support. Both Northwestern and Parkdale are diverse schools made up of large immigrant and first-generation American populations. Students organized the protests through social media. The Prince George's County School system warned the students in advance that they would receive unexcused absences for walking out of school. "If Trump will be in office for four years, guess what? We're going to be out here for four years," said one Parkdale High School student.